RACING HOME ACROSS THE ATLANTIC. A fine study of the Dreadnought, one of the fastest of all sailing ships. This vessel was built for the American Red Cross Line in 1853 to compete with the steamships of that period. She was 200 feet long on her keel, 212 feet on her deck, had a beam of 41½ feet and a hold depth of 26½ feet. Primarily an emigrant carrier, the Dreadnought could take 200 passengers in her ‘tween decks; she had, in addition, accommodation for a number of saloon passengers. 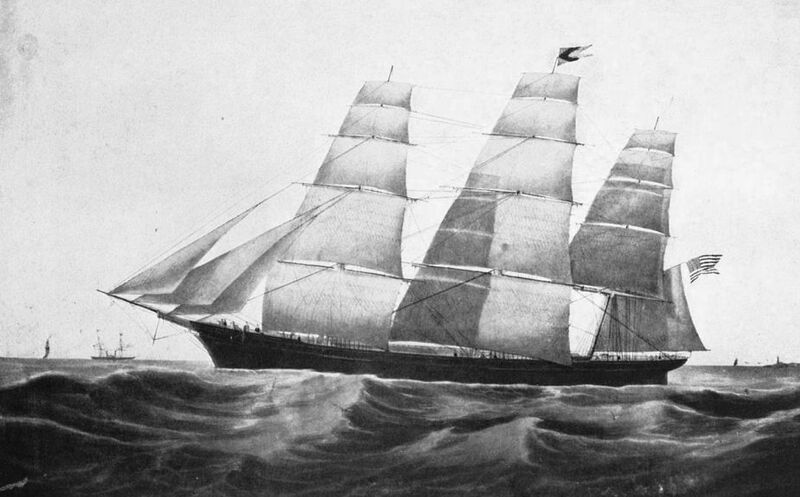 THE clipper packet Dreadnought of 1853 may be regarded as the high-water mark of the Atlantic sailing vessel. Her story is one of the most vivid of the romantic chapters in shipping history. In many ways she satisfies the schoolboy’s idea of what a clipper should be, with her bucko mates, mutinies, shootings and reckless carrying of sail through all weathers; in other ways she stands as a gallant defender of a cause that was already lost. When she was built, steamers had been running regularly across the Atlantic for fifteen years, during which time sailing packets had been steadily losing ground. Until 1850 they had, at least, retained the profitable trade of carrying emigrants, but after that date, when the Inman Line of steamers was started, sailing ships had lost even that monopoly and their position was desperate. Throughout the ’forties stories of the horrors of the emigrant trade in sailing ships appeared in the press. When William Inman, a young man of twenty-five, with large ideas and unlimited confidence, decided to start a line of steamers, he and his wife crossed the Atlantic in an emigrant ship to see for themselves the causes of the most bitter complaints and to rectify them. Wooden paddle-steamers, carrying sufficient coal for their extravagant engines, had to disregard the cheap emigrant trade; but Inman, with his more economical iron screw ships, saw not only the possibility of profits, but also the chance of improving the conditions and comfort of emigrants. Even before Inman’s venture there had been considerable improvements, and the poorer class of sailing ship was gradually being forced off the trade. Emigrants were able to discriminate, and speed alone was no longer the sole inducement. Transatlantic passages were given much publicity in the press, and the ship with the best reputation secured the business. The more reputable packet owners improved their tonnage and aimed at a better average speed without undue discomfort to their emigrant passengers. Donald McKay was the outstanding figure among New England shipbuilders catering for this policy. 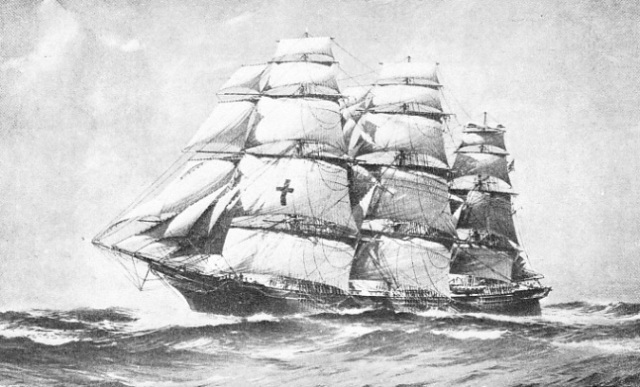 In 1843 the packet St. George, the second ship that he designed and built, was the first passenger packet owned by the American syndicate which ran its ships as the Red Cross, or St. George’s Cross Line. The heads of this syndicate were David Ogden, E. D. Morgan, F. B. Cutting and others, all practical shipping men with an eye for a fine ship. The St. George was of 845 tons register, but by 1846 the standard tonnage for this trade was over the 1,000 mark. When the Inman Line began there was a sharp division of opinion among the clipper shipowners and builders as to whether this new menace should be met by the most extreme type of fine-lined clipper or by a stronger hull, better able to stand the heavy seas of the,Western Ocean and more fitted to be pressed in a gale. In 1853 McKay built the extreme clipper Chariot of Fame, 2,050 tons, and Currier and Townsend, of Newburyport (Mass. ), the more moderately designed Dreadnought. The shrewd directors of the Red Cross Line saw the danger and realized that they needed a remarkable vessel to check the inroads of the steamer into their business. Speed was a necessity, but the new type of ship must also have the maximum comfort possible in a sailing clipper, especially if she hoped to attract passengers of the cabin class. The Red Cross Line chose excellent builders in Currier and Townsend, many of whose designs had proved fast; in addition the owners aimed at getting the views of the practical seamen from among whom they intended to select the ship’s master. The directors persuaded Captain Samuel Samuels, a young man who had already made a high reputation as a captain of emigrant packets, to join their venture. They offered good terms, including a present of shares in the ship, commission on all that she earned and good pay; in return he had to take partial responsibility for her design and was to be wholly responsible for the supervision of her construction. They could not have chosen a better man, although he had not yet had the opportunity of showing all those qualities which were to make him successful. Practically self-educated, he had run away to sea in the ‘thirties at the age of eleven and had begun his nautical career, as did so many other distinguished American sailing-ship men, on the rivers and coasts. That was a rough school, better for seamanship than for manners, and young Samuels made the most of it. Crimps and West Indian pirates were incidents in his boyhood. At the age of twenty-one, after service as mate of the New York sailing ship Manhattan, he was given her command on the captain’s resignation at Amsterdam, the crew having deserted. It was no light task for the youngster, brought up in American methods, to run a crew of slow-moving Dutchmen, whose language he could not understand; but he gained invaluable experience by having a free hand to choose his voyages, fix freights, see to repairs and maintenance and do all that was necessary to run the ship. He finally sold her in Hamburg, where the buyers, impressed by the manner in which he had persuaded them to pay a good price despite her need of many repairs, offered him a partnership. He preferred the sea. Samuels took a passage home in the sailing packet Catherine. He made so great an impression on her master that he was offered the post of mate for a voyage while waiting to take up the promised command of the Angelique, then homeward bound. 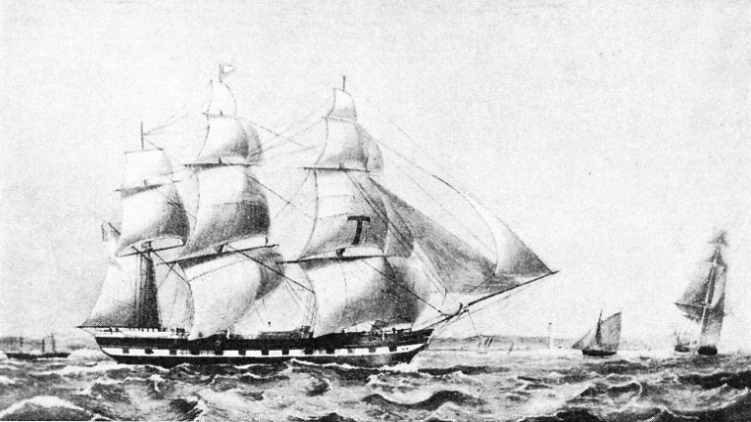 He commanded the Angelique for three years on the emigrant trade between Amsterdam and New York, although she was by no means a crack vessel, Samuels made the most of her and gained a high reputation. On the strength of this he was selected by the Red Cross syndicate for the command of what was intended to be one of the finest, although not the largest, of the clipper packets. The respect paid to the master of such a ship in shipbuilding and shipping circles in New England was both a revelation and a lesson to him. In his own words: “Swearing, which appeared to me so essential in the make-up of an officer, I found degrading in a gentleman and I prohibited its indulgence. I also insisted that the crew should be justly treated by the officers.” He seems to have known when to turn a blind eye to the particular brand of justice which had to be handed out to over-troublesome “packet rats” by his mates. To the passengers and his officers he was the model of the young clipper captain, respected, well-groomed and quietly spoken, but always perfectly self-confident and calm in an emergency. The Dreadnought undoubtedly owed her conspicuous success at a difficult time to the personality of her master. She was a fine ship, however, universally admired by the critical seamen who sailed the Atlantic in the ‘fifties: 200 feet long on her keel, 212 feet on her deck, she had a beam of 41 ft 6-in and a depth of hold of 26 ft 6-in. These measurements gave her a tonnage of 1,413 by the old measurement and 1,227 by the new; her robust lines permitted a dead-weight capacity of about 2,000 tons. As with all the clippers of her day, she was loftily rigged and carried stu’nsails; but Samuels did not favour the “flying kites” and “pocket handkerchiefs” of some masters. She was magnificently constructed of the finest material alow and aloft. Her builders were anxious to keep alive on the Atlantic the sailing ship in which they had specialized, and shrewd Samuels had carefully examined every bit of material worked into her. The Dreadnought, which was primarily an emigrant carrier, as were all the sailing packets, could accommodate over 200 in her ‘tween decks, which were available for cargo on the eastward run. She had also accommodation for a number of saloon passengers who preferred the sailing ship to the steamer, in a big saloon or cuddy aft with cabins leading out of it. Her captain’s manner and reputation soon proved a great advertisement, and the fact that he carried his wife and family on board was a guarantee of the respectability of the ship’s conduct, by no means then universal among packets. This made a special appeal to saloon passengers, and the ship was fully booked a season in advance. THE REPUTATION OF A FAMOUS SHIPBUILDER, Donald McKay, was made in the middle of the nineteenth century by the number of fast clippers built by him. Above is the Joshua Bates, one of Enoch Train’s transatlantic packets, designed by McKay. The large “T” in the fore topsail, more conspicuous than the normal house flag, will be noticed. This clipper marks the transition stage between the former square-built packets and the extreme clippers which came into service later. Her lines would not permit her to ghost along in the faintest of airs as did the extreme clippers, but faint airs were not the normal condition on the Atlantic, and she had the reputation of never having been passed by a sailing ship in more than a four-knot breeze. She twice carried the latest news to Europe between steamers and was often entrusted with specially marked mails. She could be driven through the worst weather when other ships were forced to heave-to. Her reputation was so great that she regularly received extra freight midway between that of the steamer - which carried only the finest goods because of her bunkers - and the sailing ship. Her owners would frequently guarantee a time for delivery or waive the freight money. In eleven years she made thirty-one round voyages between New York and Liverpool, the average of twenty eastward passages being nineteen days, nine of them sixteen days or under, and the worst thirty days. Westward she was handicapped, as were all sailing ships, and, to a lesser extent, all steamers, by the “Brave West Winds”; but the average of twenty voyages was twenty-six and a half days, five of them thirty days or over and the best nineteen days, through bad weather which severely handicapped her rivals. Twice in one year she was forced into Fayal, in the Azores, for repairs. It is small wonder that sailors called her the “Wild Boat of the Atlantic”, or the “Flying Dutchman”, in memory of Samuel’s days in the Angelique on the Amsterdam trade. “Dear Mr. Morrison, - You ask me for the record voyage of the Dreadnought. We discharged the pilot at 3 p.m., February 27, 1859, off Sandy Hook. We were off Queenstown at the end of nine days seventeen hours, when we sent our mails ashore by a Cork-pilot boat. The wind then became variable and died down. In thirteen days eight hours we were abreast the North West lightship of Liverpool and one hour later anchored in the Mersey, March 12, noon. The following will give you an account of the character of the ship and the time she made, including the above. In 1854 she made the same passage in thirteen days eleven hours, and six times in succession under sixteen days, including one run of fourteen and one of fifteen days. Unfortunately the owners did not keep their copies of the official log, and the captain’s own were destroyed in the accident which ended his Western Ocean career; but there is little reason to doubt the passage, considering its long acceptance by expert critics. Liverpool Irishmen, who were magnificent seamen but among the wildest afloat. Any sign of weakness displayed by the afterguard led to trouble, and the methods of the bucko mates, brutal as they seem nowadays, were necessary. Many surviving sailing ships were almost controlled by these hands, and the sight of the Dreadnought running regularly with perfect discipline on board, and a reputation which put many others to shame, was distasteful to them. A plot was hatched out in a boardinghouse for sailors, one of the worst in Liverpool. A gang, the “Bloody Forty”, was responsible for it. A few of this gang in the forecastle of the Columbia had recently murdered Captain Bryer for offending their dignity, and it was decided to treat Samuels in the same way. Liverpool detectives and the Board of Trade learned of the affair anti advised Samuels to refuse to sign on a crew composed almost entirely of the gang; his professional pride was touched, and he boasted that he would master them before he reached New York. He took the precaution, however, of drawing their teeth as far as possible before they left Liverpool, while the officials were still on board. He made every man have the point of his sheath knife broken off in the carpenter’s shop. Then, laying all hands aft, he addressed them, saying that he knew of the oath that they had taken in the Liverpool boarding-house “to clip the wings of the Dreadnought and give the skipper a swim”, and then told them to carry on. During this address the officers searched the forecastle for hidden weapons. The storm soon broke. The helmsman was insolent and attempted to knife the captain, who promptly knocked him senseless and had him put in irons, the second mate taking the wheel. The crew refused duty until the man was released and assumed a threatening attitude, while a number of emigrants on board huddled as close to the poop as they were allowed. Samuels armed himself with two revolvers and, with his faithful dog Wallace, a huge creature, went forward and drove the mutineers into the forecastle, although he had good reason to know that all their knives had been repointed. Some of the passengers wanted the ship put into Queenstown; others, including a number of former German soldiers, volunteered to help the captain. The first mate was an old man, the second a coward, and the third fully occupied with the wheel, so that Samuels wanted more support than his loyal apprentices could give him. Starvation soon took the heart out of the mutineers and they gave in after a final fight. When the ship berthed in New York the men who had tried to murder Samuels cheered him to the echo. In 1863 the ship’s luck turned. Until then she had never reduced sail below double-reefed topsails, nor had she been hove-to at sea; but five days out from Liverpool she encountered a furious gale, and Samuels had to reduce her to a reefed main topsail only. The helmsman lost his nerve, letting the ship come to so that a mountainous sea pooped her, carrying away the steering gear, smashing the skylight, flooding the cabin and staving in the hatches. Samuels was thrown down and badly injured, the femoral artery being punctured and his right leg sustaining a compound fracture. The carpenter was killed and there was panic on board. From his cabin Samuels, despite his own agony, contrived to get some sort of order and, after a vain attempt to turn the ship, sailed stern foremost to Fayal in fifty-two hours. Within two months he was back in the ship and completing her voyage, but it was long before he recovered. After a spell in steam he gave up the sea, although he lived to the age of eighty-five. With the loss of her captain the Dreadnought's luck changed entirely. On her next voyage she again lost her rudder and was partly dismasted. Captain Lytle, who had succeeded Samuels, received injuries from which he died. She again contrived to make Fayal for repairs, but it would obviously have cost a lot of money to-put her in racing trim again, and the prospects of the Atlantic service did not promise to cover it. She was put on the San Franciscan run, protected by law from foreign competition and made a number of miscellaneous voyages before she sailed from Liverpool to San Francisco in April, 1869, under new owners. At daylight on July 4 she was discovered to be among the breakers; she soon struck and was obviously doomed. Her captain and crew contrived to land on Cape Penas on the island of Tierra del Fuego. After seventeen days of terrible hardship, living on such shellfish as they could find on the beach, they reached Cape San Diego, where they succeeded in attracting the attention of a Norwegian barque which carried them to Talcahuano, in Chile. The news of the loss of the Dreadnought created a sensation in all parts of the world. Her fame was such that seafaring men of all the maritime countries knew of her exploits and talked of her records. Her beautiful lines had captured the imagination of many who resented the success of the steamship, and the passing of the Dreadnought seemed to them to symbolize the doom of the clipper ship. THE SOVEREIGN OF THE SEAS of 1852, a contemporary of the Dreadnought and almost the final development of the big American clipper ship for the services to the Californian gold-fields round the Horn. As a masterpiece of the designer’s and shipwright’s craft, this vessel was remarkable. Her success, however, tended to lead American shipping men to ignore the advantages of the fast-improving steamer and contributed to the decline of American shipping during the following years.